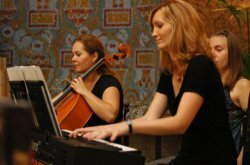 Classical music will fill the hall of the leading bath palace in Budapest and in Hungary: Gellert Spa is the home of several chamber music concerts during a year, before Christmas you can hear and Advent concert, and on other special days like the Day of Spas and Baths, enjoy classical music in Gellert Spa. You can also enjoy the music without buying an entry to the bath, just visiting the main hall. 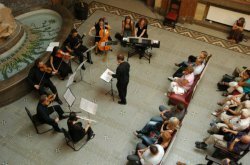 At 13.30 pm the Hungarian Presto Chamber Orchestra is presenting their Advent concert free of charge in the Art Deco hall of the spa. Get in the mood for Christmas with beautiful music in a beautiful building. The upcoming weekend of October 12 and 13, 2013. We celebrate the blessing of the hot springs and the pleasures of thermal baths with some beautiful melodies. The concert is not only for bathers, and massage guests, but for all who enjoy music, from tango to film music. The lively program of the Spa Concerts are not revolving around water themed music. Instead they include pieces from various film music genres. Adam Weidemann will be announcing the pieces of the concert.